Banffshire & Buchan Coast MSP Stewart Stevenson has welcomed the award of £500,000 to Banff in the latest round of Historic Scotland’s Conservation Area Regeneration Scheme. Historic Scotland is an executive agency of the Scottish Government charged with safeguarding Scotland’s historic environment. The Conservation Area Regeneration Scheme awards funds to encourage local authorities to help spur economic regeneration through investment in their historic environments. Banff was previously awarded money in the first round of the Conservation Area Regeneration Scheme. “I am delighted to see the Scottish Government celebrating the value of beautiful, historic Banff in this way. The funds will help preserve the buildings of Banff while also bringing jobs to the area and boosting the local economy. For more information about the Conservation Area Regeneration Scheme, please visit http://www.historic-scotland.gov.uk/. “Clearly, a feasibility study is a very necessary first step to determine whether or not such a move is possible and I’m delighted that the local transport partnership, NESTRANS, are being asked to take this forward. Banffshire & Buchan Coast MSP Stewart Stevenson has said consumers can have confidence in quality-assured Scottish meat following the recent scandal surrounding Tesco supermarkets and other retailers and the content of burgers being sold by them. Mr Stevenson has highlighted the work done by Quality Meat Scotland (QMS) and the high standards demanded by their various quality assurance schemes which cover all aspects of the food production chain from farm to fork. “The quality assurance schemes in Scotland guarantee Scotch Beef comes from cattle born, reared and slaughtered in Scotland. The industry, rightly, takes great pride in the world-leading traceability which it has in place. “The recent publicity surrounding Tesco has unfairly tarnished the reputation of all farmers who provide high-quality meat which is traceable to source. “I am watching this developing situation with concern and will monitor developments. MSPs have joined forces with Focus Scotland Magazine to make promoting community based volunteering their New Year Resolution. The campaign launched aims to get the Scottish public to embark on a volunteering journey in 2013 whilst raise awareness and promoting community volunteering in 2013. Pledging to support the campaign the MSPs signed banners promoting the campaign, which aims to encourage more people in Scotland to volunteer within their community with the hope to see an increase in community involvement throughout the country in 2013. Following a positive year for the image of volunteering with the successful summer of Games makers with the Olympic Games, Focus Scotland hope that individuals within Scotland continue to volunteer and hope that the campaign will act as a reminder for them of the impact they can have at community level. “The importance of volunteers in our communities cannot be overstated and this campaign is an opportunity for us all to recognise the good work of volunteers across Scotland, and to encourage more people to get involved in activities in their community. “Be it taking some time to help out our elderly neighbours, becoming involved in a charity or youth group or helping to organise the 2014 Commonwealth Games, there are endless ways people can help out in their local area, and have a great time, learn new skills and make new friends in the process. The last Scottish Household Survey showed that 30% of adults volunteer; this campaign hopes to add to that figure by encouraging everyone to kick off the New Year with a resolution to volunteer in their local community and make a difference. If you have any time to donate and would be interested you can find out more about volunteering by visiting the portal for all volunteering in Scotland www.volunteerscotland.org.uk or by contacting your local Volunteer Centre. 30% of adults in Scotland volunteer through an organisation or group (Scottish Household Survey, 2009/10). These volunteers give over 142m hours each year, equating to an economic value of £2.2bn. 60% of people feel they have never been asked to volunteer (VDS, 2004). An estimated 78% of young people do not associate volunteering with good citizenship (Being Young in Scotland, 2009). Volunteering can deliver health benefits to volunteers (Volunteering England, 2008). Volunteers report that their volunteering provides them with valuable skills and experience, and helps them find a job. Volunteering can have major positive benefits, including skills development, health improvement, mental wellbeing, building confidence and self esteem. Banffshire & Buchan Coast MSP Stewart Stevenson this week used the Scottish Government’s debate on oil and gas in Parliament to highlight Scotland’s potential to remain at the cutting edge of future hydrocarbon generation. With a long tradition of expertise in energy technology, Scotland is already providing for the future with the creation of the national Energy Skills Academy, which encompasses colleges in the Banffshire & Buchan Coast constituency. The graduates of this industry-leading skills academy will be at the heart of the development of future technology such as carbon capture and storage – a pioneering example of which is based at Peterhead Power Station. “We must map our transition not just in Scotland but across Europe and the world. A huge economic and environmental opportunity comes from the development of carbon capture and storage not simply for us, but as an exportable technology and a technology that we can use our engineers to support. “After independence, not only would industry and the Scottish Government be just as motivated to continue development and support a long-term future for the energy industry, but they would have the necessary levers of power to ensure competition. Banffshire & Buchan Coast MSP Stewart Stevenson attended Buckie Thistle’s first game of the New Year yesterday [Saturday]. 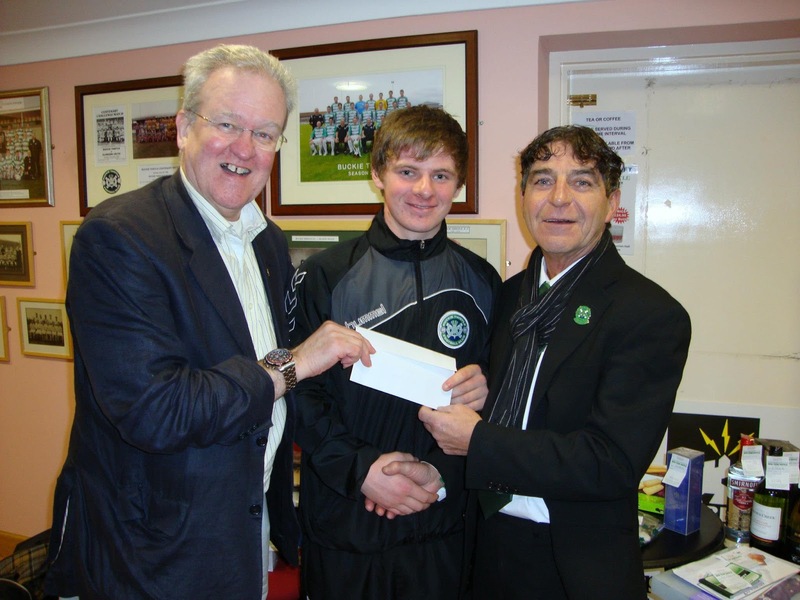 The Jags were at home to Fraserburgh and Mr Stevenson accepted an invitation from Buckie Thistle directors to attend and also draw the raffle at half-time. “I was delighted to see two of my constituency's teams engaged in such a hard-fought and entertaining match. At the end of the day 3-1 for Fraserburgh was the outcome although I had been looking for a draw so that neither of my teams lost! “I was pleased to draw the winning ticket for the Jags' £500 raffle and as luck would have it, a Buckie team player won it. Perhaps a wee bit of compensation for the result. Member of Parliament for Moray, Angus Robertson, and Member of the Scottish Parliament for Banffshire & Buchan Coast, Stewart Stevenson, have welcomed the announcement by Associated Seafoods of a multi-million pound investment in their businesses in Buckie. “This investment to upgrade the Moray Seafood site and locate the existing Lossie Seafoods business there is a vote of confidence in the fish processing sector in Buckie. With the aim of substantially boosting turnover and securing the current workforce it will help to bring a degree of certainty those employed by the business. “Fish processing provides significant employment across the north east and this investment in Buckie will cement the area’s reputation for producing some of the finest seafood products in the world. “Given the wider economic circumstances the confidence of Associated Seafoods in their brands, their Buckie location and in the workforce that turns out such a high quality product is great to see.